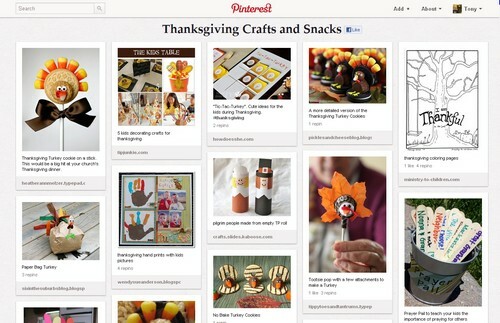 What crafts are you planning for Thanksgiving? Do you know of an easy Thanksgiving craft for children? This page lists some simple craft ideas for church around Thanksgiving. If you know of more resources, leave a comment at the bottom of the page. Enjoy these christian thanksgiving crafts. We also have a collection of Bible verses about thankfulness and several Bible lessons for Thanksgiving. Craft – Make a Thankful Poster: This craft is super easy and will help the children understand what it means to be thankful. It would be a perfect addition to your Thanksgiving Sunday School lesson. Thanksgiving Craft Bag Book: This one has more steps so watch the how-to video carefully. Includes printable directions. We have uploaded some Thanksgiving coloring pages for kids that would be the perfect add on for nearly any lesson. Kids will add leaves to the tree with specific things they can give thanks about. Similar to the thankful poster idea. Here is a second coloring sheet for Thanksgiving. 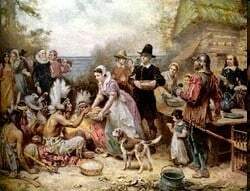 This one shows a traditional family seated around the dinner table. The captions says “Be thankful in all things.” This would be a great family activity sheet or lesson extra for Sunday School. This coloring page features a Pilgrim family and their prayer of Thanksgiving to God as their ship arrives safely. It’s a more historical approach to the holiday and would be great for homeschool or Christian schools. Also illustrated by Mandy Groce. Thanksgiving Crafts & Activities: Danielle’s Place has a great collection of activities and projects related to Thanksgiving. They are 100% free and easy to print off and use in your Sunday School. DLTK’s Crafts & Coloring Pages for Thanksgiving may be just what you need. Family Fun has a long list of decorations and crafts. These are great to do at home with your kids or in Sunday school. 30 Thanksgiving craft links from Frugal Living. Bible Kids Fun Zone (scroll to bottom of their page): This is a link to a membership site, but they do offers four free printables for Thanksgiving at the very bottom of their page. Many of these would be great for preschool Sunday School lessons around Thanksgiving time. Kidology Thanksgiving Zone: This is a membership site, but since I’m a member I always start here. Pastor Karl and company consistently add great content to their zones. They offer many thanksgiving craft ideas and thanksgiving bible lessons for kids. Need more help? Then print off our Thanksgiving Lesson for Preschoolers or this Children’s Church lesson about Giving Thanks to God.